Game-changer alert! This is a campaign and a movement that could take the current body positive and plus size movement in the fashion industry to the next level. Easily one of the most popular women’s websites in the world, Refinery29.com have teamed up with brands Lane Bryant and Aerie Lingerie and ‘Orange Is The New Black’ actress Danielle Brooks to flip the script on the norms in fashion editorial. The ‘See The 67’ is about giving visibility to the majority of bodies which are not represented in the current fashion and media worlds. “67” refers to the 67% of women across the US who are a size 14 or higher, which is considered plus size in fashion. Surely you see what’s wrong with that equation, right? If the majority of bodies in this country are of a certain size demographic, why are they being lumped into some sort of “otherness” in favor of a small minority which happen to be thin? “Meet the invisible majority. Most American women are plus-size, but they make up less than 2% of the images we see. We want to change that,” says the opening statement on the campaign announcement. We could talk about stats, data, feelings, and reasons all day long, and in fact we have dedicated plenty of space on our website to championing the brands and people who are determined to change the status quo in the industry. Refinery29, Lane Bryant, and Aerie aren’t just pointing out the heinous problem, they have created a solution which will either allow the industry toward a practical change, or be exposed for wanting to continue to perpetuate unhealthy, unrealistic norms. We’re hoping it will be the former! “Beginning today, we are breaking the plus-size woman out of the niche and into the mainstream. During the launch week, 67% of the bodies you see on our site, in our newsletter, and on our Instagram and Snapchat channels will be plus-size. To do this, we’ve made significant changes within Refinery29 to fully represent the 67% this week, and beyond. For the last six months, we’ve been shooting stock photography and redesigning illustrations to more accurately reflect the women who make up the majority of our country. And we’re partnering with Getty Images to make this collection available to other outlets that wish to join us in closing the representation gap,” says a description of the campaign. “Not only have we faced practical challenges, but we’ve had to reckon with deeper issues of bias and prejudice along the way. Effecting real and lasting change on a grand scale will require collaboration with more websites, media outlets, and, of course, you. As an audience, your power is significant and undeniable, and we can’t go anywhere if you’re not along for the ride,” it continues. There are myriad excuses for publications, designers, and websites not choosing to invest in more diverse imagery and messages. Not enough plus size models available? Can’t find stock imagery featuring a range of plus size women? Plus size clothing doesn’t sell as well (the billion dollar market begs to differ…)? It’s not as aspirational (again, the billion dollar plus size market begs to differ)? Not only is this campaign about visibility and flipping the script, it’s about dismantling unconscious bias which can be a driving force for the narrow norms. “Here’s a term to get familiar with: unconscious bias. This is not the overt prejudice you see in the headlines but the language in between the lines. Not showing the 67% in normalized ways has real consequences: Plus-size women earn less and are more vulnerable to discrimination. That’s why we need to see more of you on our site,” says Refinery29. They are leading by example, by pledging to ensure a certain number of images in their own editorial feature plus size women, but have also created a bank of images available for everyone from Vogue magazine, to a small-town fashion blogger to license on Getty Images. So what excuse to publications have now? While our site does not publish fashion editorials, we like to focus on fashion stories that are about pushing the norms and breaking down barriers, so wherever possible, we too will continue to share stock photos that are far more diverse than what is currently on offer. R29 co-founder and global editor-in-chief Christene Barberich is quoted on the campaign page talking about how they hope to expand the parameters of the way plus size fashion and women are talked about. “Plus size women are not a niche but the norm; not just a lone column in a magazine, website, or community – they are the community itself,” she said. Actress, designer and outspoken figure on body image in the media Melissa McCarthy is also quoted on the site sharing her thoughts on how the term “plus size” is treated by the mainstream. “You’re taking your biggest category of people and telling them, ‘you’re not really worthy’. I find that very strange,” she said. Refinery29’s message is a clear and resounding “YOU ARE WORTHY” and they refuse to have it any other way going forward. And let’s be clear, this is NOT in any way about shaming thin bodies at all. Every body deserves to be represented in equal and beautiful measures, and right now there is an overwhelming abundance of size 0, mostly Caucasian women featured in advertising and editorials. We would also like to see a lot more ages represented, as well as differently-abled models who seem to be regularly left out of the fashion conversation. 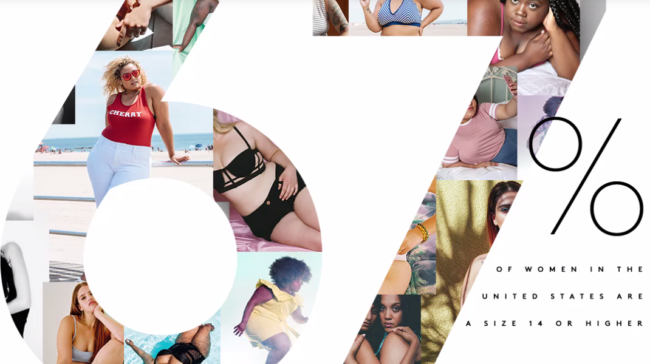 If you want to take part in this movement, Refinery29 are encouraging people to upload their own images to social media showing what they would like to see more of, using the hashtag #seethe67. If the industry is taking notice, they’d be wise to do a search of that hashtag and get some real-world ideas of what consumers what to see.